Starting a garden from scratch poses many questions. When it comes to forming up a planting design – whether it’s a matter of so many plants and so many favourites or having no idea at all – your surroundings usually offer good answers and the walls around a garden are among the best cues. Walls are part of the garden composition: the backdrop to trees, hedges and borders in the foreground. Co-ordinating the soft and the hard will help integrate the indoors with the outdoors. Painted walls might open up the possibilities. The colour can always be changed. 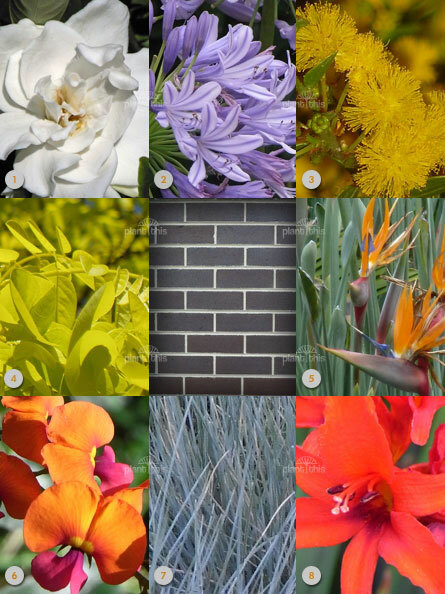 But even with all the variations of clay, many natural bricks can be reduced to a handful of colour categories – each with their own complementing or contrasting plant colours. The red brick wall is a friend to blocks of foliage and hedges in dark green. For variety, introduce purple, silver or blue-grey leaves. Blue flowers are a sure thing; especially dark and vibrant blues but also down to pale blues. Even pinks work better if they tend more toward mauve. Ever-reliable white is better as off-white with its purity knocked off, but before getting too yellow as cream. Brown brick is similar but more sombre than red. It can stand lightening up with yellow-green or chartreuse foliage. Silver-grey will stand out against the darker background as will the outline of variegated plants that have leaves edged in a light colour. Blue again works well as will purple flowers. This time choose from cleaner whites and a broad range of pink from pastel to vivid – especially near grey leaves. 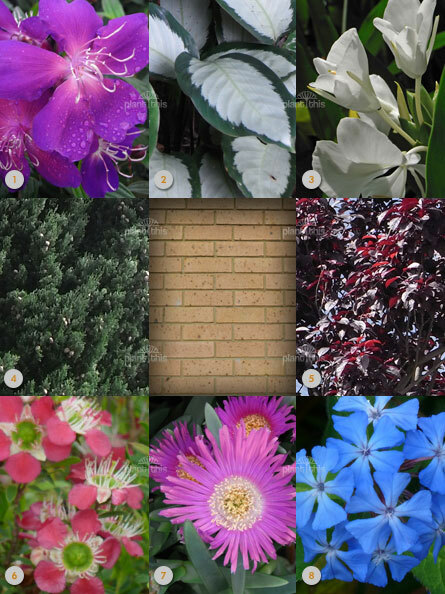 Work in negative for foliage but similarly for flowers against blonde brick. Dark green and purple leafed plants and those with dark-coloured edges make a good bridge from this light background. The beauty of the blonde is fast to fade and dim with accumulated dirt. Keep it bright with saturated pinks, purples and blues and clear white and steer away from pastels. Liver brick is making something of a comeback in contemporary design. It also offers the opportunity to be dramatic with hot saturated colours like red, orange and golden-yellows and the brilliance of chartreuse foliage. These hot beds fire up best with a dash of electric blue for contrast. Taking a different tack, pale blues with pink and white plus grey-green or blue-grey foliage make a more restrained effect. 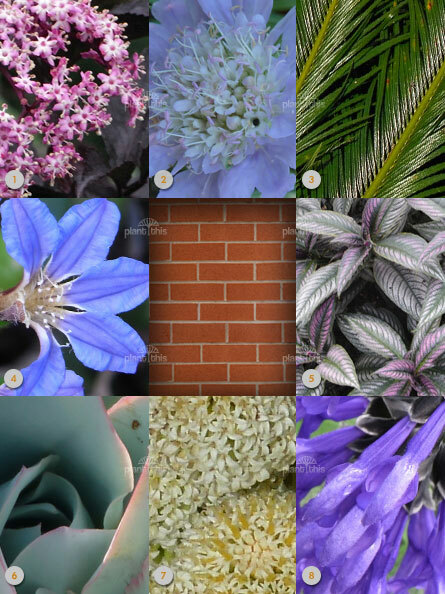 Although a trusty guide to continue with, brick walls don’t demand a colour theme be rigidly imposed over the whole garden. 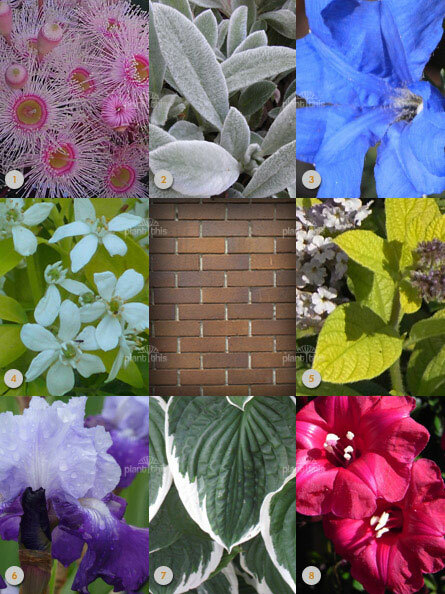 But the bricks are a good starting point for choosing the plants – and their leaf and flowers colours – to place in front of them. Tropical planting design can imitate rainforest jungles with a dense and seemingly random tangle of vegetation that creates cool and shady spaces.